Since 2011, TPP have advised on three major projects which are now under construction in the Vauxhall Nine Elms Battersea (VNEB) Opportunity Area. TPP continues to advise several developers in respect of their proposals in the VNEB area with two further schemes at the northern end of the Opportunity Area. The most recent project to receive consent involved the redevelopment of Hampton House on Albert Embankment by St James Group. 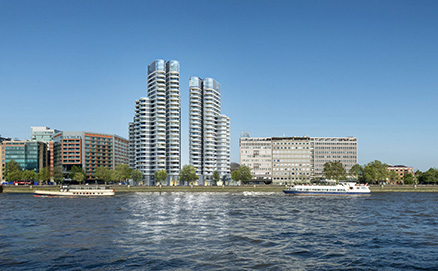 The scheme, designed by Foster & Partners, will be known as The Corniche and is a residential lead mixed-use scheme involving several buildings up to 27 storeys in height. TPP were appointed to advise St James Group during their acquisition of the Hampton House site in 2012 and for the preparation of the planning application. The 253 residential unit scheme has a parking provision which significantly exceeds the maximum typically permitted for other developments within the VNEB Opportunity Area in Lambeth. The comprehensive Travel Plan prepared for the scheme, including regular monitoring of vehicle movements and measures to mitigate traffic impact if targets are exceeded, was key to Lambeth officers being willing to accept a higher parking provision for the development in this area. In addition to completing schemes in Lambeth, TPP have also advised on sites within Wandsworth which also lie within the VNEB OA, including St James’ Riverlight development.